The way you choose to organize your books will depend on the size of your collection. There are three main methods I suggest; color coding, alphabetizing, or organizing by genre. In terms of aesthetics, this is a great way to bring life to a book shelf and/or a room. Using the acronym that represents the color wheel, “ROY G BIV” (red, orange, yellow, green, blue, indigo, violet as well as white, black, & silver/grey) will help you to organize your collection in a way that is visually pleasing. While it may look great, this method does not organize your collection in a way that makes it efficient to find a book later. Limit it to small collections or smaller book shelves in bedrooms, etc..
Alphabetizing your collection makes it super easy to find a book when you need it. You can either alphabetize by the authors last name or by the title of the book. Whether it be cook books, mysteries, or self help, determine the genres that make up your book collection and organize by theme. These 8 clever labeling ideas come from Apartment Therapy. We found a website called Woodworking Parts that sells brass and nickel-plated label holders, specifically sized for shelf edges (about $8 for 10). Rockler also sells them for $3.39 per set of 2. You can order custom-engraved or blank metal tags in a variety of sizes from MetalTags.com, a manufacturing company based in Houston, Texas. We called to see if they take retail orders, and they told us that they do, but they require a minimum amount of $50. You could also try your local hardware store for custom-engraved tags. Library supply stores are a good place to look. 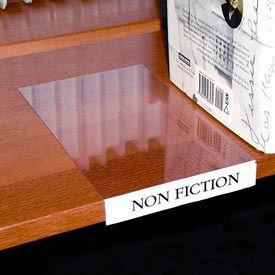 Demco sells clip-on, adhesive, and magnetic shelf labels. Levenger also sells sets of 6 clip-on labels for $28. Use chalkboard paint to make your own chalkboard labels, or try out these blackboard vinyl stickersfrom Etsy ($18 for a set of 16). Repurpose write-on metal, ceramic, or slate garden markers into shelf labels by adding removable adhesive backing. Cut up adhesive-backed cork sheets into the appropriate size, and stencil or stamp your tags directly onto the cork. It creates a rustic, wine-cellar-style look. Another way to dress up DIY labels is to stamp or stencil your tags onto Scotch paper tape. The Container Store sells plastic shelf labels (about $6 for 4), as well as magnetic erasable labels for metal shelves ($11 for 5).